As I read it over and over again, I realize they are words I should take to heart myself. I am the type of person who lives for the next big exciting event. Whether it’s a grand vacation, an exciting holiday, a birthday, a good friend’s visit, or the eating of a magnificent ice cream cone, I usually find myself just a little devastated inside when it’s all over. Last year, after having a magical adventure in Italy, I boarded a plane in Rome, took my seat, plugged in my MP3 and decided to let the great Frank Sinatra and legendary Tony Bennett serenade me all the way home. As I sat on the plane for nearly twelve hours, I tried not to cry, but I just couldn’t believe my grand adventure was actually over. Heck, just two months before, I had made myself a green, red, and white paper chain – just like an eight year old would do – and had started counting down the days until I met the Pope. Every day as I ripped one of the links from the chain I would imagine all the different flavors of gelato I would taste-test and all the handsome Italian men who would spoon feed them to me. Of course, I could only try and imagine the breathtaking beauty that was in store for me in Italy - from Assisi, where the beauty is found simplistically in nature, to Florence and Rome, where men over many centuries have created the magnificence that would leave me awe-inspired. Even though my trip did not turn out as my daydreams had exaggerated, the experience was phenomenal, nonetheless. I did cry on that plane ride home though, and that’s okay, because darnit, not ONE Italian man spoon fed me anything! That was disappointing. Add to that, my grand adventure that I had dreamed of for so long was officially over. But I’m not gonna cry anymore just because it’s over. I'm not. Instead, I’m gonna put on my happy face and smile because I feel completely blessed that it happened in the first place! Annnnnd….the Pope said a special prayer for me in German, which I didn’t understand but it was a prayer, so that’s gotta be good. Of course, there were thousands of people there with me, but I’m pretty sure that somewhere in the midst of his German speak, I heard him say my name. I could be wrong. But my version of the story makes me happy inside, so that’s the version I‘m going with. 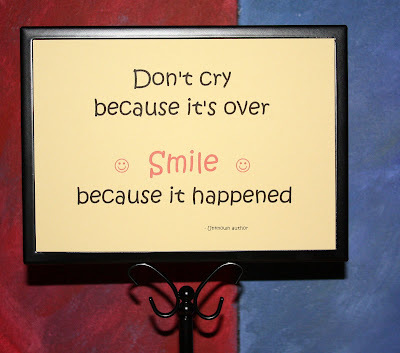 Me Smiling – No Tears! You are so much fun! I always get excited when I see you've done a new post. This one is just a cute as always! What a great post! I will take your words to heart and try to pick the smile over the tears more often when life's little adventures are suddenly at an end.